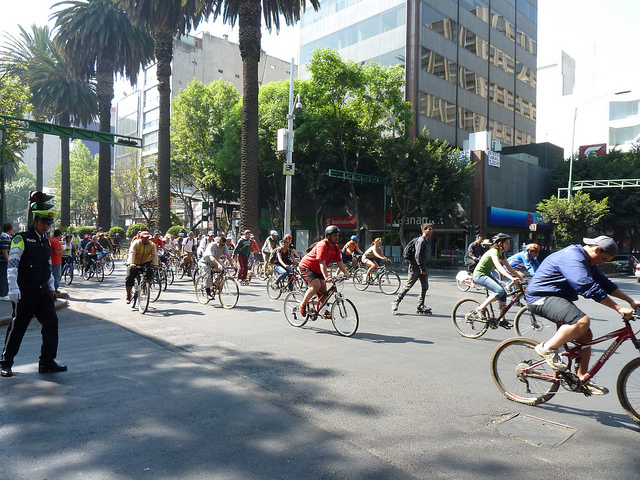 Mexico City has been experiencing a rise in its bicycle culture. Photo by Dani Simons. Lima’s Metropolitano BRT system celebrated its 100 millionth passenger this week. At the end of 2010, the BRT system was carrying an average of 220,000 passengers daily. Today, the daily passenger rate is at 360,000 individuals. The goal for December 2011 is to transport half a million passenger per day. Mexico City is seeing a rise in bicycle use among its middle and upper classes, according to news from USA Today. Local cycling initiatives started in 2006 in Mexico City under the leadership of Mayor Marcelo Ebrard. Since then, cycling has become a fashionable transport mode. The local environment secretariat estimates that there are 100,000 cycling trips made daily in the city. U.S. Transportation Secretary Ray LaHood announced a $75 million federal funding to improve the oldest and slowest active commuter rail line in the Massachusetts Bay Transportation Authority. The funding is estimated to bring employment opportunities to 260 people. Real estate agents in Cape Town, South Africa report that the implementation of MyCiTi Bus Rapid Transport system in the city’s West Coast corridor has had a positive impact on the property market. The efficiency of the public transport system halved the time properties remain on the market. Mayor Bloomberg announced a $20 million gift to the city’s famous High Line park from the Diller-von Furstenberg Family Foundation. Previously, the High Line needed $85 million to finish the design and implementation of the park and maintain it for three million visitors every year. Michigan Gov. Rick Snyder is calling on state legislature to approve a proposal that would allow local municipalities to raise vehicle licensing fees to a rate between $40 and $120. The raised rates would bring in between $300 million and $1 billion for infrastructure and transit projects in Michigan. Louisville, Ky. is losing its trees and not replacing them, says a report from the Courier Journal. Invasive pests, neglect and age are destroying the city’s urban forestry and it goes beyond aesthetics. Trees can produce millions of dollars in energy savings and pollution reductions. Exxon Mobile reported a quarterly profit of 41 percent, or $10 billion. The profits come at a time of a 7 percent fall in oil production. The Jakarta, Indonesia administration unveiled a draft budget for 2012 that focuses heavily on public transportation improvements and flood mitigation efforts. New York has been conducting long distance bus inspections during September and early October. The inspections resulted in the suspension of 116 bus drivers and 95 buses, Governor Cuomo’s office says. The inspections come in the wake of a fatal accident that took place in the Bronx that killed 15 people. The state’s motor vehicle department will continue its efforts on cracking down bus services using facial recognition technology. Travel on U.S. roadways reached its lowest level since 2003, reports the Department of Transportation. In the first eight months of this year, travel went down by 1.3 percent, or 26 billion vehicle miles. A new study out of Temple University Fox School of Business found that individuals who view their car as an extension of themselves have stronger aggressive driving tendencies. The study also found numerous relationships between character traits, world view and aggressive driving, one of which is how increased materialism, or the importance of one’s possessions, is linked to increased aggressive driving tendencies. Daimler’s Car2Go car-sharing program is ready to expand. Until now the program was working only in four cities; one in the United States, one in Canada and two in Europe. The company says that it will now expand to 40 to 50 cities in Europe and add several new locations in the United States. Car2Go is different from its competitor, ZipCar, in that it allows one-way rentals. Lunar Europe Green City e.V., a Munich-based design firm, and the University of Wuppertal joined forces to create a new mobility sharing system, called Mo. Mo is a way to access car-sharing, bike-sharing and transit all with one card. Users can rack up points with bicycling and earn free car-sharing time or transit value. The system also functions as a social network.